James “Chick” Mayben visits SONG. 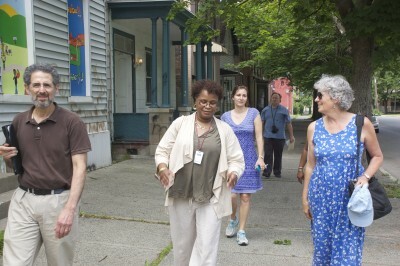 Walking tour of Hillside North, Troy. 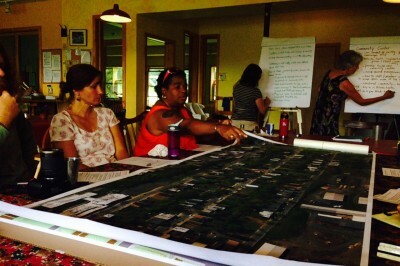 In June and July, more than two dozen people met in Troy, N.Y., and Ithaca to work on community design ideas for Hillside North, a nine-by-three block neighborhood in Troy. Design charette for urban community development with TRIP staff and residents. The Troy Rehabilitation and Improvement Program (TRIP), was the winner of $5,000 in consulting services in a statewide contest held by Learn@EcoVillage and our Communities That Work partners. 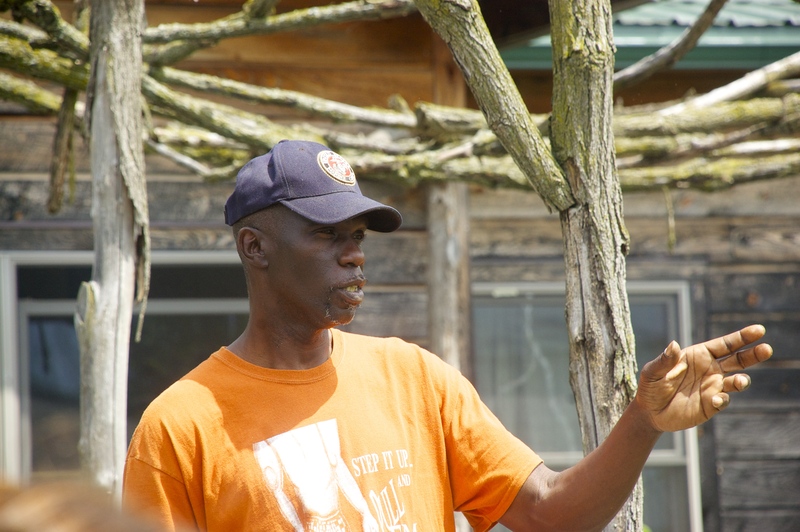 A three-year grant from the U.S. EPA, now ending, funded this sharing of best practices developed at EcoVillage Ithaca. Special guest Irene Nielson, Climate Change Coordinator for Region 2 of the EPA, joined the Ithaca design meeting and noted that the design charette process brought together the Ithaca EcoVillage, Aurora Pocket Neighborhood (the first pocket neighborhood in Ithaca) and Troy communities “for design-inspired peer exchanges that do not simply strive to reduce current problems but instead engage the group to create a vision for a sustainable and thriving community.” Anasha Cummings, TRIP’s sustainability coordinator , agreed. “TRIP’s mission often keeps us focused on the triage aspects of serving a distressed neighborhood,” he said. 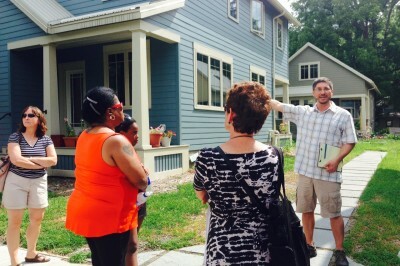 “So it was extremely valuable for us to come and see the developments in Ithaca, and to start to think about how we could leapfrog our development process to build tight-knit, sustainable neighborhoods.” Hillside North residents were intrigued with drawings by architectural designer Rob Morache showing cozy cottages stepping down the hills of vacant lots. They also loved the Common Houses at EcoVillage, and saw the potential for dedicated neighborhood space to build community. Everyone present at the design meeting affirmed that “We want to make a big splash.” With so many problems to surmount, a big vision is important to motivate people, and to engage more institutional partners. 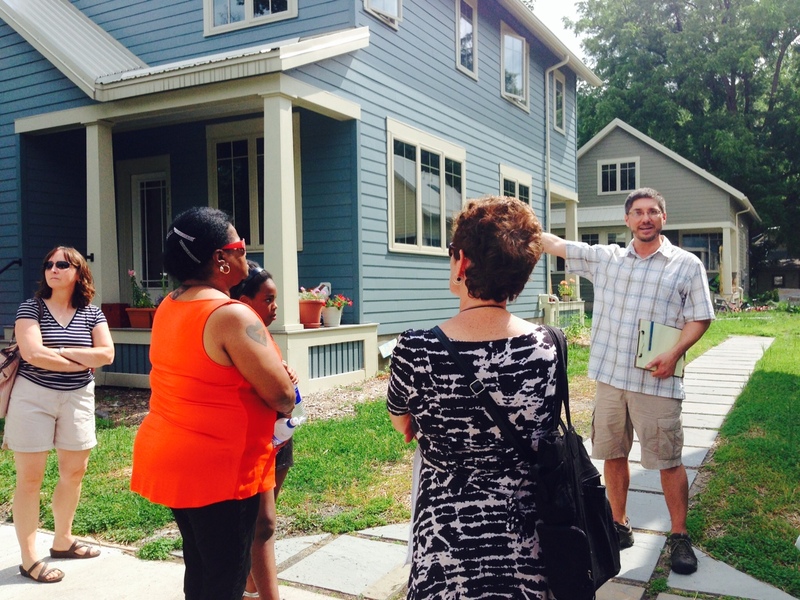 Rob Morache describes the Aurora Pocket Neighborhood in downtown Ithaca. What about next steps? Rob Morache will deliver a report with recommendations emerging from the charette, with a conceptual design showing what they might look like. 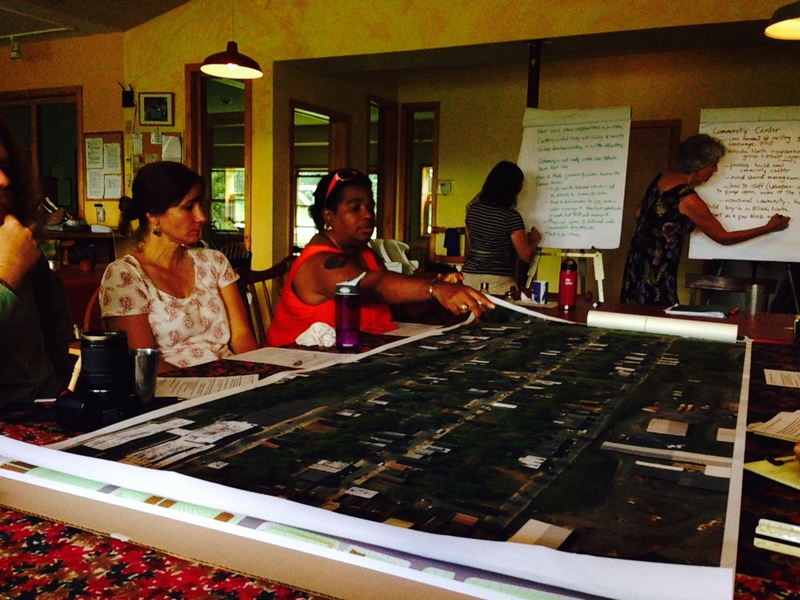 TRIP followed up with this news: “We had a great stakeholder meeting, where people agreed to a major planning process. We are looking at a couple of available grants that could help fund that process and make it much more robust.” Meanwhile the City of Troy recently voted to move forward with its planning process, which includes a comprehensive re-zoning. Anasha shared, “We are excited to be in such a good position going into that process.” It’s wonderful to see that principles piloted at EcoVillage Ithaca are relevant to many different settings.